This particular project involved taking a Craftsman style home that is nestled into Mission Hills. It was built in 1914 and has a historic designation as a craftsman style home. Working on a historic home is always an honor and very exciting. It’s important to make sure we keep the original charm and ‘essence’ of the home, while giving the homeowner the updated amenities and fixtures that they desire. This is a dream project for a San Diego interior designer. For this phase of the project the homeowner wanted us to update her master bathroom. Our challenge was to take an 11.5’ x 8.5 room that was cut into two smaller, chopped up spaces and convert it into a larger more cohesive on-suite master bathroom. The homeowner is an artist with a rustic, eclectic taste. The space was made extremely functional, by opening up the room’s interior into one united space. We then designed and created a unique antiqued bead board vanity and furniture-style armoire with unique details that give the space a nod to its 1914 history. Additionally, we added some more contemporary yet rustic amenities with a granite vessel sink and wall mounted faucet in oil-rubbed bronze. The homeowner loves the view into her back garden, so we emphasized this focal point, by locating the vanity underneath the window, and placing an antique mirror above it. It is flanked by two, custom-made, hand-blown Venetian glass pendant lights that also allow the natural light into the space. We commissioned a custom-made chandelier featuring antique stencils for the center of the ceiling. The other side of the room features a much larger shower with a built-in bench seat and is clad in Brazilian multi-slate and a pebble floor. A frameless glass shower enclosure also gives the room and open, unobstructed view and makes the space feel larger. The room features its original Douglas Fur Wood flooring that also extends through the entire home. 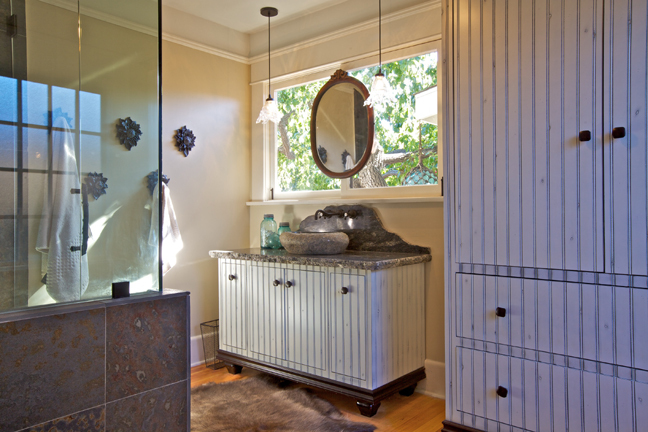 The final result was an open, inviting eclectic bathroom retreat.